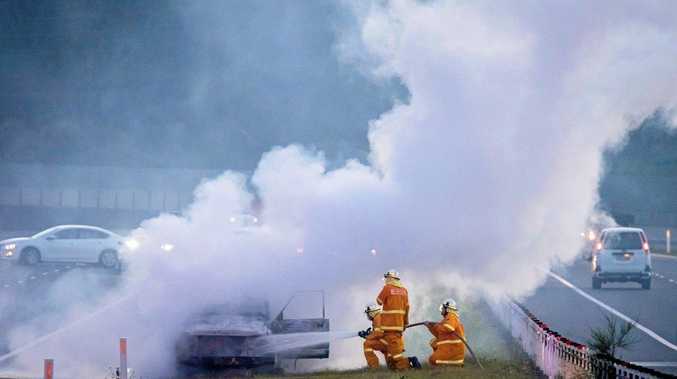 A VEHICLE fire that engulfed a 4WD on the Pacific Highway south of Woolgoolga proved a tricky response for Coffs Coast NSW Rural Fire Service crews. A motorist was driving along the highway on Wednesday evening when a fire ignited and flames quickly engulfed the vehicle. The motorist was able to pull the vehicle over on a grassed median strip to avoid impacting other vehicles. Several calls were made to fire crews. "The Woolgoolga Brigade responded first followed up by the Moonee Beach Brigade," Coffs Harbour-based NSW Rural Fire Service Inspector Michael Brougham said. "The crews arrived on scene to find the vehicle well alight. "An added complication to the fire was that the vehicle had an LPG cylinder on board. "Crews quickly extinguished the flames and used hoses to cool the cylinder and stop flames from reaching the rear of the vehicle. Photographer Judd Findlay, who was passing the scene stopped to capture these incredible images. Traffic was held up on the highway for a short time.